Download "Guidelines for the Provision of Assistive Technology to Students with Disabilities under IDEA Part B"
1 SPECIAL EDUCATION IN NORTH DAKOTA North Dakota Department of Public Instruction Kirsten Baesler, State Superintendent Office of Special Education 600 E. Boulevard Ave., Dept. 201 Bismarck ND (voice) (TDD) (Fax) Guidelines for the Provision of Assistive Technology to Students with Disabilities under IDEA Part B United States Department of Education, Office of Special Education Programs (OSEP) The Department of Public Instruction appreciates the time and effort spent by the task force members in contributing to the development of this guidance document. 5 Guidelines for the Provision of Assistive Technology to Students with Disabilities under IDEA Part B 5 Purpose of the Guidelines Consider this final thought from the Preamble to IDEA, 2004: Almost 30 years of research and experience has demonstrated that the education of children with disabilities can be made more effective by... supporting the development and use of technology, including assistive technology devices and assistive technology services, to maximize accessibility for children with disabilities. Guidelines for the Provision of Assistive Technology in Educational Settings is intended to serve as a resource for IEP and Section 504 teams looking to overcome barriers to learning for all students with disabilities while developing greater functional independence through individually determined solutions. The purpose for these guidelines is to: Update previous guidelines. Identify the legal requirements for consideration of AT in the IEP process. Provide clear guidance to IEP and Section 504 teams on the consideration of AT for all students with disabilities. Provide clear and consistent definitions of AT for use statewide, as well as an understanding of low tech and high tech AT options across the curriculum. Promote the use of AT across all environments through a collaborative approach with parents and professionals, leading to greater independence for the student. Promote the concept of Universal Design for Learning (UDL) and the use of AT within that framework. Promote the understanding and use of Quality Indicators of Assistive Technology (QIAT) in the ongoing pursuit of improved services for students with disabilities. Serve as a resource for families and professionals across North Dakota regarding AT. Lewis (1993) articulated two primary purposes for AT: AT 1. Serves as a means to augment an individual s strengths so his/her abilities counterbalance the effects of disabilities; and 2. Provides an alternative mode for performing a task to compensate for existing disabilities or to bypass the disability entirely. Simply stated, the goal of AT is to enhance students performance on a specific task (Edyburn, 2005) or their ability to maintain current performance levels and achieve success in the instructional program. 6 Guidelines for the Provision of Assistive Technology to Students with Disabilities under IDEA Part B 6 Introduction to Assistive Technology We live in an age when technological advances seem to appear daily, changing the ways in which we live our lives and creating greater access to information. For students with disabilities, technology is an important tool for reducing barriers to learning and independence. Assistive technology and accessible educational materials create opportunities for students with disabilities to enjoy greater access and meaningful participation in the general education curriculum with their nondisabled peers. Technology plays an important role in ensuring that all students with disabilities receive a free and appropriate public education (FAPE). Assistive technology (AT) refers to technologies that are specific to individuals with disabilities. In the school setting, when a particular type of technology is identified as AT, the AT should be documented in a student s IEP, 504 or other accommodation plan that may be provided to an eligible student. Legal Definitions 34 CFR Sec The Individuals with Disabilities Education Act (IDEA) of 2004 includes a legal definition of assistive technology. Assistive technology device means any item, piece of equipment, or product system, whether commercially acquired off the shelf, modified, or customized, that is used to increase, maintain, or improve the functional capabilities of a child with a disability. (Authority: 20 U.S.C. 1401(1)) It is important to provide some interpretation of language used in the regulation. The words any item can be interpreted broadly to include any technology. Technology may be high tech, such as voice-activated software, or it may include many low tech options such as pencil grips, therapy balls, or other items that increase the learning and independence of students with disabilities. The words product system refer to an AT solution that may require multiple technologies to work together in order to benefit the student with a disability. An example could be a student with a switch mounted on a wheelchair that is used to access an augmentative communication device. The phrase whether acquired commercially off the shelf, modified, or customized indicates that AT systems and tools may be purchased outright. However, once the technology has been purchased, it may require modifications for the individual just as the driver of a new car needs to make adjustments to the vehicle to drive comfortably, the same is true for AT. Adjustments may be required to customize the technology to meet a student s individual needs. 8 Guidelines for the Provision of Assistive Technology to Students with Disabilities under IDEA Part B 8 Delivering AT services requires more than simply providing the assistive technology. It also includes: the process used to consider the need for AT; the selection of AT; the training needed by the student, parent, and school personnel to support its use; a trial use of the AT; and a monitoring process to determine the effectiveness of the AT in assisting the individual with a disability to meet his/her goals. The obligation of a public agency to ensure the availability of assistive technology follows: 34 C.F.R (a) Each public agency must ensure that assistive technology devices or assistive technology services, or both, as those terms are defined in and 300.6, respectively, are made available to a child with a disability if required as part of the child s- 1. Special education under ; 2. Related services under ; or 3. Supplementary aids and services under and (a) (2) (ii). Assistive technology in the school setting is considered to be a compensatory intervention. As such, it includes a set of procedures or tools that allow students with disabilities to increase their performance on a given task without necessarily increasing the underlying skills associated with the task. 1 Further, Wojcik (2005) and Parette (2006) offered a pragmatic definition of AT as a type of compensatory intervention. According to their definition, AT is any tool or system of tools that allows an individual to complete a task that, without that tool, the individual would not be able to complete at the expected level of performance. Frameworks for Considering Assistive Technology IDEA included a requirement that IEP teams consider assistive technology devices and services as a special factor as they develop, review, or revise IEPs for students with disabilities. 34 C.F.R (a)(2) Development, Review, Revision of IEP (2) Consideration of Special Factors The IEP Team shall- (v) Consider whether the child needs assistive technology devices and services. 1 Illinois Assistive Technology Guidance Manual, 2012. 9 Guidelines for the Provision of Assistive Technology to Students with Disabilities under IDEA Part B 9 Given this clear mandate regarding the consideration of assistive technology, the question becomes how to effectively implement this requirement into the IEP process for individual students. A number of protocols for the consideration process have emerged in response to this question. Universal Design for Learning Before reviewing specific options to give consideration to the need for assistive technology devices and services for an individual student with a disability, it is important to examine the larger context of efforts to create instructional methods, materials, and assessments that work for all students flexible approaches with the ability to be customized and adjusted for individual needs. 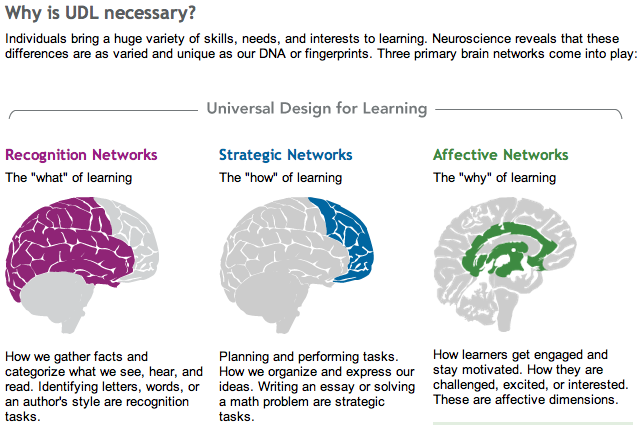 This larger context is known as Universal Design for Learning (UDL). While UDL grew out of the movement to eliminate physical barriers to individuals with mobility impairments in design and construction, the concept found application in learning. UDL embraces considering the needs of the broadest range of users from the beginning. 2 The chart below provides a comparison between AT and UDL. Assistive Technology (AT) Specifically considered for an individual student. Used by a student to meet the expectations of the general education curriculum. Monitored by special educators but also used by general education teachers. Universal Design for Learning (UDL) Makes the general education curriculum accessible to students with varying needs. Use by all students with diverse learning needs. Implemented by general and special education teachers. Retrieved from: Maryland Learning Links, In the educational context, the relationship between UDL and AT can be conceptualized in the familiar pyramid format, where Tier 1 includes UDL for all learners, and movement up the Tiers provides more focus on the individual needs of learners. 2 Quote, Ron Mace, Architect. The Center for Universal Design, College of Design, North Carolina State University. 13 Guidelines for the Provision of Assistive Technology to Students with Disabilities under IDEA Part B 13 all students to meaningfully participate in that curriculum, and increased achievement for all students. 3 For additional information about UDL, please visit the National Center on Universal Design for Learning at Additional resources on UDL are located in Appendix B (p. 58). Accessible Educational Materials (AEM), NIMAC, and NIMAS Within the UDL environment, AT or accessible educational materials (AEM) provide students with access to the curriculum and instruction. AEM may be required for some students, but may also be needed by many others. IDEA (Section ) requires that states and districts provide AEM to students who are unable to utilize print-based materials, whether due to blindness or another print disability. AEM includes those materials that are designed or enhanced to be used to address the range of student variability, regardless of their format (print, digital, graphical, audio, or video). Both content and the technology used to deliver that content must be accessible and usable by individual students. 4 The National Instructional Materials Access Center (NIMAC) is a federally funded electronic file repository for National Instructional Materials Accessibility Standard (NIMAS) files which can be converted into specialized formats. The IDEA 2004 created the NIMAC to receive the NIMAS source files from textbook publishers and makes those files available to authorized users through an online database. The NIMAS format is an XML-based source file that is not intended for use directly by students. These files, created by publishers, are used as a starting point for the creation of braille, audio, large print, or digital text formats. The NIMAS files may not include images and/or be appropriate for all students. Districts should carefully consider a variety of factors to ensure that all curriculum materials files can address a wide variety of learners. The NIMAC provides the source files created by the publishers to authorized users in each state who perform the task of converting and/or distributing the accessible versions to eligible students. In North Dakota, there are 2 entities that can request NIMAS Files; they include the North Dakota Department of Public Instruction and the North Dakota School for the Blind and Vision Services. More information about Accessible Formats, can be provided by a Teacher of the Blind and Visually 3 Zabala, J. S., UDL, AIM, and AT: Complementary Supports for the Achievement of All Students, Center for Applied Special Technology (CAST), retrieved March 24, 2015 from 4 Ibid. 16 Guidelines for the Provision of Assistive Technology to Students with Disabilities under IDEA Part B 16 There are a number of common errors in the consideration process, as identified by QIAT. They include: 1. AT is considered for students with severe disabilities only. 2. No one on the IEP team is knowledgeable regarding AT. 3. The team does not utilize a consistent process based on data about the student, environment, and tasks to make decisions. 4. Consideration of AT is limited to those items that are familiar to team members or are available in the district. 5. Team members fail to consider access to the curriculum and IEP goals in determining if AT is required in order for the student to receive FAPE. 6. It AT is not needed, the team fails to document the basis of its decisions. AT Consideration Guides: GPAT and WATI Given the guidance provided by the QIAT, consideration guides and checklists have been developed to support districts in this process. The Georgia Project for Assistive Technology (GPAT) Assistive Technology Consideration Process Guide represents an example of a checklist or consideration guide that IEP teams may use to guide their discussions about AT. This guide provides a framework for considering AT for students at all levels; it also may serve as documentation of the IEP team consideration process. In addition, a resource guide was developed as a companion to the consideration guide in order to assist IEP teams with identifying potential modifications, accommodations, standard classroom tools, and AT solutions that may be needed to support a student s individual needs. The resource guide looks at sample instructional tasks across the curriculum and suggests potential AT solutions for students who have challenges with those tasks. The Assistive Technology Consideration Resource Guide is available from GPAT at: The GPAT s Assistive Technology Process Guide is available in Appendix E (p.83). The Wisconsin Assistive Technology Initiative (WATI) developed a guidance document for IEP teams on the AT consideration process. The WATI Assistive Technology Consideration Guide assists IEP teams in evaluating an individual student s skills and abilities and identifying those tasks that create barriers to the student learning and being able to demonstrate their learning. 17 Guidelines for the Provision of Assistive Technology to Students with Disabilities under IDEA Part B 17 This guide uses a series of questions to assist the IEP team in determining whether a student does or does not need AT devices and services. The questions include: 1. What task is it that we want this student to do that he/she is unable to do at a level that reflects his/her skills/abilities (writing, reading, communicating, seeing, and hearing)? 2. Is the student currently able to complete tasks with special strategies or accommodations? 3. Is there currently assistive technology (devices, tools, hardware, or software) used to address this task? 4. Would use of assistive technology help the student to perform this skill more easily, in the least restrictive environment, or perform successfully with less personal assistance? The WATI Assistive Technology Consideration Guide is available in Appendix E, (p. 81). It is excerpted from a larger document, Assessing Student Needs for Assistive Technology (ASNAT), 5 th Edition, which serves as a resource manual for school teams. The complete manual is available on the WATI website at: While IEP teams have options when considering a student s need for assistive technology, a limited number of outcomes may result: 6 = 1. The student independently accomplishes the required tasks within the relevant instructional or access areas using standard classroom tools. AT is not required. 2. The student accomplishes the required tasks within the instructional or access areas using standard classroom accommodations and modifications that are in place. AT is not required. 3. The student accomplishes the required tasks within the relevant instructional or access areas with AT that has been determined to be educationally and functionally necessary, and is currently in place. AT is required. Document required AT devices and services in the IEP where appropriate. Monitor the use of AT and adjust as necessary. 6 Considering Assistive Technology for Students with Disabilities, Georgia Project for Assistive Technology (GPAT), 2004. 18 Guidelines for the Provision of Assistive Technology to Students with Disabilities under IDEA Part B The student is unable to accomplish the required tasks with the relevant instructional or access areas with modifications, accommodations, and/or the AT that is currently in place. If potential AT solutions are known to the IEP team, trial use of the identified solution(s) may be documented in the IEP and implemented. If potential AT solutions are not known to the IEP team, the team may choose to access consultants or other individuals with expertise who can assist the team in addressing the AT needs, or refer the student for an AT assessment. A trial use period may be recommended following the assessment. While Congress mandated the consideration of AT needs and services, this discussion should be brief and not appreciably increase the length of an IEP meeting. This consideration, which may be defined as a thoughtful look, should include some discussion of whether AT might be useful and/or is needed. If a more lengthy discussion is necessary to review a student s needs and possible AT solutions, an AT evaluation may be appropriate and that recommendation should be documented in the IEP. Another important element in the consideration discussion will be the need for assistive technology services. AT services may include such things as: An evaluation of the student s need for AT; Training for the student, family, and/or staff on the use of AT; Technical supports on operation or use; Modification or customization of the AT; Other technical assistance for school personnel to support proper implementation. The resources available through the GPAT and the WATI provide valuable tools for local districts to develop their own process for discussing and documenting the need for AT for all students with disabilities. When giving consideration to the need for AT devices and/or services, the IEP team should focus on the student s needs and then consider AT solutions beginning with the most simple and progressing to the more complex. AT need not be sophisticated; it simply must provide the student with access and promote their independence in daily educational tasks. 19 Guidelines for the Provision of Assistive Technology to Students with Disabilities under IDEA Part B 19 The AT Continuum Some examples of AT solutions moving from simple to more complex include: 7 Pencil grips-assist with handwriting legibility; Sticky notes and highlighter tape- mark important text; Communication books- pictures represent messages or tasks; Picture schedules-assist with following daily routines; Timers-assist with pacing during activities; Portable CD players and audiobooks-provide access to information and instruction, support with reading comprehension; Amplification systems- assist with deficits in hearing or attention; Specialized calculators (large displays or speech output); Single message voice output devices to increase participation of students with complex communication needs; Mobile audio devices -Mp3 players, tablets, and smart phones with applications. Smart Pens -assist with note taking. Mouse emulators -trackballs, head sticks, touchscreens, and/or eye gaze systems; Digital whiteboards- save and print teacher notes; Text-to-speech software - computer/e-reader speak digital text; Word prediction software assist with writing tasks. Augmentative communication tools and applications address complex communication needs. This small sample illustrates the continuum of AT options from simple to more complex. An excellent resource for IEP teams may be found on the AbleData website. AbleData is a federally funded, non-commercial, searchable database of nearly 40,000 AT products. Here, IEP teams may find fact sheets and links to disability-related organizations. AbleData may be accessed at: Tablets and mobile devices have seen a remarkable growth in their application in school settings and may be considered to be AT for an individual student. Many applications for such devices have been created for individuals with disabilities and tend to be low cost or free. These newer technologies have even begun to take the place of some specialized, more costly high tech options. The Tools for Life Project at Georgia Tech University offers a searchable database of applications for both Apple and Android devices, located at: Appendix F, (p. 97), provides additional information on AT Tools. 20 Guidelines for the Provision of Assistive Technology to Students with Disabilities under IDEA Part B 20 AT Consideration vs AT Assessment It is important for IEP teams to recognize that AT consideration and AT assessment are two very different processes. 8 The major differences in these two processes are depth and duration. As was stated earlier, consideration is a brief process that takes place during an IEP meeting. During the AT consideration process the team evaluates the student s need for: AT or additional AT, the effectiveness of current AT, the continued use of current technology, or the need to try a new AT solution to address the student s access issues. On the other hand, assessment goes into much greater detail and looks closely at a student s abilities and challenges, the specific task demands, and the environment in which the student will need AT. It also includes the acquisition of new information. When questions exist about a student s challenges and the viability of AT solutions to those challenges, an AT assessment may provide the guidance the IEP team is seeking. A flowchart of the AT consideration process can be found in Appendix E (p.80). Appendix F (p. 97) contains a brief set of resources for AT assessment. Addressing Assistive Technology in the IEP Process Consideration of Special Factors As was discussed in the previous section, IEP teams are required to give consideration to a student s needs for assistive technology and assistive technology services during any IEP meeting, whether it be initial, annual, or an amendment. The consideration of the need for AT devices and services should occur throughout the IDEA process of referral, evaluation, and IEP development. It is an ongoing process that continually reflects on a student s changing needs/goals and whether AT is necessary to meet those goals. This section provides guidance on how to address and document the process in the IEP. The North Dakota document, Guidelines: Individualized Education Program Planning Process ( suggests a logical process for considering the need for AT during the development of the IEP that meets all legal requirements. This process begins with discussions about the student s present level of academic achievement and functional performance. In these discussions, the team should define the appropriate grade-level expectations as well as the student s barriers to meeting those expectations that result from the disability. These discussions analyze the expectations for and participation of typical learners and suggest how the student with a disability can meet those expectations. 7 Access to Learning: Assistive Technology and Accessible Instructional Materials, Massachusetts Department of Elementary and Secondary Education, WATI, Assessing Students Needs for Assistive Technology (ASNAT), 5 th Edition, 2009. 21 Guidelines for the Provision of Assistive Technology to Students with Disabilities under IDEA Part B 21 Consideration of Special Factors Does the student need assistive technology devices and services? No. Assistive technology to be explored; further consideration is needed to determine if assistive technology is necessary. Yes. The IEP team has determined, after considering all areas related to the student s present levels of academic achievement and functional performance, that the student needs assistive technology in order to access the general education curriculum. The IEP team makes its determination of the need for AT following consideration of the student s present levels of academic and functional performance and the discussion of grade-level expectations. The team s decision about the need for AT is documented in the Consideration of Special Factors section of the North Dakota IEP document. The discussion of the student s needs and expectations for classroom tasks is central to the description of present levels of academic performance and functional achievement. When students are unable to participate in classroom tasks as a result of their disability, the IEP team should discuss the development of goals, objectives, and services that will move the student toward greater participation and independence. AT may be a factor in overcoming many learning challenges, regardless of the student s level of disability. For this reason, AT is considered for ALL students at each IEP meeting, and this consideration is embedded throughout the IEP process, from the identification of present levels through the discussions related to the development of goals and services. From Consideration to Assessment When the IEP team decides further consideration is necessary to determine if assistive technology is necessary, the process may move toward an assistive technology assessment. An AT assessment will examine/evaluate, in greater depth, the student s abilities and challenges as well as the task and environmental demands that present barriers for the student. 9 Some important points to note about the assessment process: 1. Unlike other assessment processes, the AT assessment is not completed with the administration of a test or a singular event. 2. AT assessment is an ongoing process; it is a continual part of a student s education planning. 9 Technical Assistance Guide for Assistive Technology for Children and Youth with Disabilities, IDEA Part B, Oklahoma State Department of Education, Special Education Services, 2013. 22 Guidelines for the Provision of Assistive Technology to Students with Disabilities under IDEA Part B AT assessments are conducted in the student s typical educational environments by a multidisciplinary team knowledgeable about AT devices and services. The QIAT consortium has identified Quality Indicators of the Assessment of AT Needs to help guide teams in this process. This list is included with other quality indicator lists in Appendix D, (p.62), of this document. 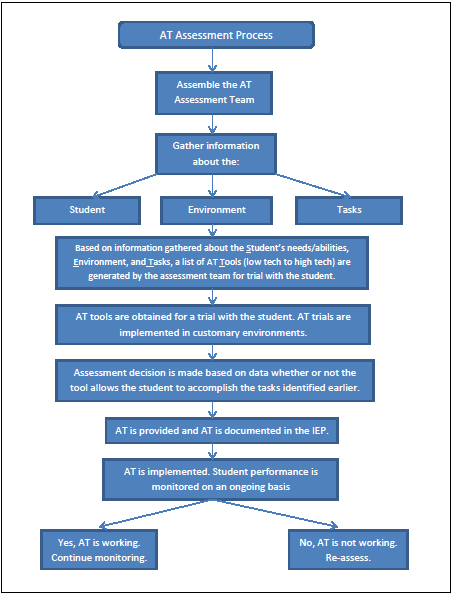 The AT Assessment Process: SETT The SETT Framework (Zabala, 1995). The SETT Framework is a systematic AT assessment process that is driven by matching individual student needs to an AT device or service that helps a student complete a task. This process can be followed for all students: it is replicable, accountable, and performed by team members who are knowledgeable about AT. 24 Guidelines for the Provision of Assistive Technology to Students with Disabilities under IDEA Part B 24 Assembling the AT Assessment Team The AT assessment team may look different than the student s IEP team, including individuals with the necessary expertise to develop an understanding of the student, the tasks expected, and the environments. The assessment team may include: The student The family The classroom teacher(s) Paraeducators School psychologist Speech language pathologist Occupational therapist Physical therapist Support service teachers (Title I, ELL) Orientation and mobility specialists Audiologist School nurse Physician Teacher of visually impaired Vocational counselor/case manager School administrators AT specialists AT providers Transition specialist The AT assessment team should include members that fulfill the following roles: A person knowledgeable about the student, which may be the student, parents, and/or other family members. 2. A person knowledgeable in the area of curriculum, often a special or general education instructor. 3. A person knowledgeable in the area of language, usually a speech/language pathologist. 4. A person knowledgeable in the area of motor skills, generally an occupational or physical therapist. 5. A person who can commit the district s resources, not only for the purchase of devices but also to authorize staff development and provide assurance of implementation in various settings, both educational and 6. extracurricular usually an administrator or director of special education. Districts should look to assemble a team from the above list of individuals who are able to address these five roles and their perspectives during the assessment process. 10 Assessing Students Needs for Assistive Technology (ASNAT): A Resource Manual for School District Teams, Wisconsin Initiative for Assistive Technology (WATI), 2009. 25 Guidelines for the Provision of Assistive Technology to Students with Disabilities under IDEA Part B 25 Gathering information about the Student, Environments, Tasks, and Tools During the information gathering stage of the SETT Framework, team members may choose from activities such as: Record reviews to determine if the specialized assessment information available may provide insights on the student. Interview the student, family members, and/or various school personnel to obtain information regarding questions about the student s needs, abilities, interests, preferences, and participation patterns. Observations of the student in natural settings in various activities. Observers should note the participation of nondisabled peers. Work samples are gathered to compare the student s performance to what is expected of the non-disabled peers. Interactions with the student, focusing on engaging the student in tasks similar to what is required in the classroom. Create opportunities for the student to try AT and/or modifications/accommodations that may be helpful. An examination of each element of the SETT Framework follows: The Student: What is (are) the functional area(s) of concern? What does the student need to be able to do independently that is difficult or impossible as a result of their disability? What are the student s special needs related to the area of concern? What are the student s current abilities related to the area of concern? What are the expectations for the student and the concerns related to those expectations? What are the student s interests and preferences? Teams may wish to use the WATI s Student Information Guide to inventory the student s needs and/or barriers to their learning or participation in the general education curriculum. This Guide s set of questions in any of the twelve areas and the answers can help identify the barriers limiting the student s access, participation, and/or progress in the general education curriculum. This information can be used to complete the relevant sections on the TIENET North Dakota Technology Guide form leading to the determination of the AT and/or features of the AT device that will be necessary for the student to access, participate in and make progress in the general education curriculum and complete related activities or tasks. 26 Guidelines for the Provision of Assistive Technology to Students with Disabilities under IDEA Part B 26 Areas covered by the WATI Guide include: Seating, positioning, and mobility Communication Computer access Motor aspects of writing Composition of written material Reading Mathematics Organization Recreation and leisure Vision Hearing General The WATI Student Information Guide is available in Appendix F, (p. 106), and is included in the manual Assessing Students Needs for Assistive Technology (ASNAT) available from The Environments: What is the arrangement (both physical and instructional) in the student s various environments? What supports are available (to both student and staff) in the various environments? What materials and equipment are commonly used by other students in the various environments? Are there access issues for the student (technological, physical, and instructional) in the various environments? What are the attitudes and expectations of staff, family, and others in each environment? WATI has included an environmental observation guide that draws an observer s attention to what is going on in an activity in a particular setting. The WATI Environmental Observation Guide is included in Appendix F, (p. 129). The Tasks: What specific tasks in the student s natural environments will enable progress toward mastery of IEP goals and objectives? What specific tasks are required for active, more independent involvement in the identified environments related to communication, instruction, participation, productivity, and environmental control? 27 Guidelines for the Provision of Assistive Technology to Students with Disabilities under IDEA Part B 27 The WATI Environmental Observation Guide also provides suggestions for documenting tasks during observations. The document includes: a description of the task, an expected response or product, and any barriers to task completion. From this documentation, a set of potential adaptations for the student with a disability is produced. The Tools: The final step of the SETT Framework requires teams to analyze the answers to the questions asked about the student, the environment, and the task using the question below. Based on the team s determination that AT would be needed by the student, the team would follow the process described after the question: Is it expected that the student will not make reasonable progress toward their IEP goals and objectives without the use of AT devices and services? o If the answer is YES, describe what the useful system of supports, devices, and services would be like. o Brainstorm specific tools that may be included in a system to support a student s needs and move toward greater independence in the least restrictive environment. o Select those tools for trial in the student s natural environments. o Plan the specifics of the trial (expected changes, when/how tools will be used, what cues may be used, etc.). o Collect data on the effectiveness of the AT being tried. Appendix G (p. 145) provides an abbreviated list of potential AT tools that is taken from Assistive Technology in Education: Nebraska s Guide for the Delivery of Assistive Technology Services for Students with Disabilities. In addition, the WATI Assistive Technology Assessment Checklist (Appendix F, p. 137) organizes its set of suggested AT tools by task or task requirements. The AT Decision Making Process Following the gathering of information through file reviews, observations, etc., the assessment team is ready to make decisions regarding AT solutions for a student. Through use of the SETT Framework, the assessment team has focused on the student, his/her personal characteristics and interests, the environment (including the physical arrangements as well as instructional activities), and the tasks or specific activities required of the student in each environment. This leads to a clear definition of the problem that will guide the team in generating AT solutions. 28 Guidelines for the Provision of Assistive Technology to Students with Disabilities under IDEA Part B 28 An effective decision making process will include a number of important points: Problem Identification: specific definition of the student s barriers to learning. 2. Solution Generation: what are the possible solutions? 3. Solution Selection: evaluate suggestions, choose an option, and develop an action plan. 4. Implementation: carry out the action plan. 5. Follow-up: meet again to review data on the impact of the AT tool on the student s performance. This format provides districts with a systematic process for the gathering of AT assessment information and responding to that information through the identification, implementation, and review of potential AT solutions to address a student s barriers to learning. As such, this becomes a regular discussion during the development or revision of a student s IEP. Implementing AT Solutions Now that an individual student s barriers to learning have been defined and potential solutions identified, the team moves to determine if the proposed solutions will have the desired impact on the student s performance. Determining whether the proposed AT solutions will work requires the student be given an opportunity to try the assistive technology. The length of the trial period with the AT will depend on the student s needs or degree of impairment and the complexity of the AT being used. In either case, it is important to document the student s performance with the AT during the trial period. During this stage of the assessment process, the IEP team prepares an action plan for the trial period: the plan Identifies who will coordinate the trial, which may include: obtaining a device, scheduling any necessary training for staff, progress monitoring, etc. 2. Includes a training plan for the student and appropriate team members on use of the AT. 3. Proposes a start and finish date for the trial. 4. Identifies criteria to determine whether or not the trial was successful. 5. Determines a process for collecting and reviewing data with the team. 11 Assessing Students Needs for Assistive Technology (ASNAT), 5 th Ed., Wisconsin Assistive Technology Initiative (WATI), Technical Assistance Guide for Assistive Technology for Children and Youth with Disabilities, IDEA Part B, Oklahoma State Department of Education, Special Education Services, 2013. Assessing A Student s Need for Assistive Technology: Where to Start? What Exactly Is Assistive Technology? Updated December 2010- DRAFT A Guide for Writing IEPs Comments We are interested in improving this guide and welcome your suggestions. You can email your comments to the Special Education Team at dpisped@dpi.wi.gov. FAQ regarding IEP s. Does a Special Ed teacher (Service Coordinator) have to be present at IEP meeting? Yes. At least 1 must be present. Ohio AT Network ASSISTIVE TECHNOLOGY RESOURCE GUIDE Assistive Technology Resource Manual Index Introduction to Assistive Technology......................Section 1 Definitions: What is Assistive Technology?